STOP HS2 | Terminally ill will not be fast-tracked for HS2 compensation. HS2 Ltd have today published their response to the interim report of the Parliamentary HS2 Hybrid Bill Committee, with little on offer for affected individuals and communities. In total, the committee made 116 recommendations, but HS2 Ltd have only responded to 58, exactly half of them. Lowlights in the statement from HS2 Ltd include the refusal to fast-track compensation claims from the terminally ill to protect the ‘quality’ of decisions, and the refusal to pre-qualify blighted communities for compensation, because it is too difficult to figure out what a ‘neighbour’ is. 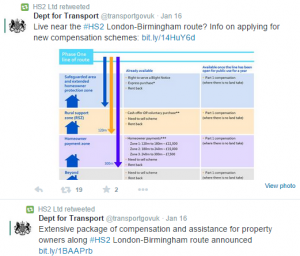 This is the entirety of the social media ‘campaign’ from HS2 Ltd promoting the new compensation schemes. The committee report also asked how extensively the new compensation schemes have been advertised. Despite the fact HS2 Ltd claimed they had written to everyone within 1km of the route about the consultation for the schemes, they said when the scheme was actually announced they had only written to everyone within 300 metres of the route this time, along with everyone who responded to the consultation, neither or which seem to be true. They also stated that “Social media activity was undertaken (using twitter) to promote the launch.” This ‘activity’ consisted of a total output of retweeting just two tweets from the Department of Transport. In response to a query about the role of the ‘Residents’ Commissioner’, the Government say they have set her the lofty goal of ensuring that HS2 Ltd are ‘competent’. Daily serious and multiple vehicle accidents are resulting in more deaths, injuries and vehicle write offs. The road transport bodies are not campaigning sufficiently with MPs and Councils for investments and changes to driver behaviour. Faster lane changers and people driving beyond the limits of braking. Novice drivers and people who have no understanding of the longer stopping distance. Tailgaters in white vans and nippy cars and four wheel vehicles 5 to 15 meters behind you at 60 to 70 mile per hour. Commercial vehicles 5 to 15 meters behind you. The UK motoways and roads are now very dangerous and very congested. Do not imagine HS2 will make a difference it will not be noticed but the prevention of investments in road improvement will be dramatic. A Prime Minister and a few Conservative MPs objecting to your priorities are resulting in more deaths and injuries on the roads by the obsession with diverting money to HS2 when ECML and other rail routes could be improved in parallel to road improvements. Please confront the deteriorating road safety it is impacting millions daily. Witnessed by being in another vehicle shunt delay and passing the blue lights at devastating scenes. Are there MPs for each party who will persuade the House of Commons the East Coast approach from Scotland to England and conecting with Europe by HS1 is best value for money for long distance north south Links. HS3 can link across to Manchester. Better than Y HS2 is a route upgrading the ECML services for the many linked to Leeds, Birmingham with short links. Y HS2 was not the better value for money as many know and many have reasoned. Please persuade your MP to debate for a review to achieve a better approach than the Y HS2 can achieve please. It would be an excellent idea to run the proposed HS services into one main London terminus, in the Kings Cross/ St. Pancras “campus”- or rather it would have been, had not the combined “super station” proposal, using the “lands” (gasworks) area located between the existing stations,been discarded about 15- 20 years ago. To revive the idea, would you suggest demolishing either the new developments on that site, or perhaps knock down the building now standing on the site of the former goods station; the British Library?